An Antioch man allegedly shot and killed his father Tuesday and then opened fire at his brother, wounding him, a neighbor said. Police confirmed that they are investigating a double shooting from around 10 a.m. on the 300 block of Lawton Street, but didn't specify the relationship between the suspect and two male victims. Three men got into an argument and one of them pointed a firearm at another when neighbors called 911, according to police. Shortly after, more calls came in about gunshots being fired. One man was on the ground, one had run away and the other had stayed at the scene, armed with what police say appeared to be a pistol, witnesses told dispatchers. Patricia Bryden, who lives next door, said the men had been “arguing for quite a while.” When his father returned home, the son "ran downstairs, got in his car and got his gun, shot his father four times, kept shooting," she said. One of the suspect's brother took off toward a liquor store and "he got shot," Bryden said. "I lay down on my floor and called 911 because the gentleman was threatening to shoot anybody in the apartments," she said. "It was very scary." Responding officers detained a suspect and administed CPR to the male victim on the ground, according to police. Paramedics took over life-saving measures, but the man succumbed to his injuries and was declared dead at the scene. "He sat there and taunted his dad … his dad that he shot dead," Bryden said. The man who had fled to a convenience store was contacted by police, and found to have a bullet wound in his upper torso. He was taken to an area hospital and rushed into surgery. Police said he is in stable but critical condition as of Tuesday evening. Police also recovered a firearm at the scene, which was allegedly used in the shooting. Images from the scene show a bullet hole in a window as well as a wall. 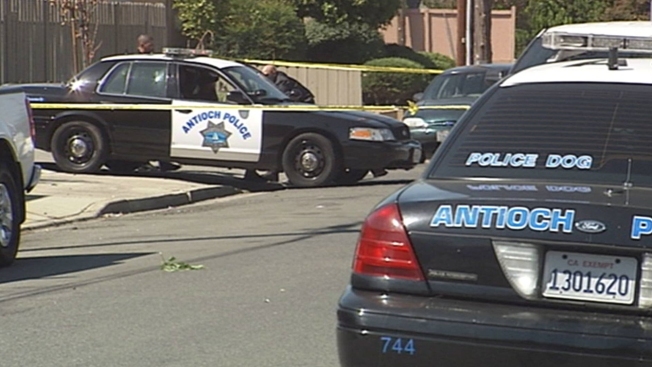 People with additional information about the case are asked to call the Antioch Police Department's non-emergency line at 925-778-2441. Tips can be texted to 274637 with the key word "Antioch."